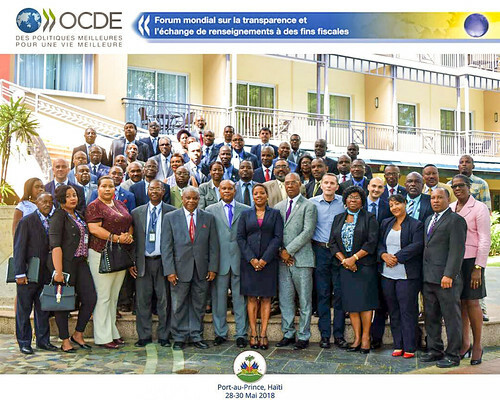 04/06/2018 - An Induction Programme for Haiti to participate in and benefit from the international advances in tax transparency and exchange of information was launched with the visit of a team from the Secretariat of the Global Forum on Transparency and Exchange of Information for Tax Purposes (Global Forum) on 28-30 May 2018. Mr. Dónal Godfrey, Deputy Head of Secretariat and Mr. Hakim Hamadi, Tax Policy Analyst visited Port-au-Prince and met with senior leaders and officials including the Minister of Finance, H.E. Jude A. Patrick Salomon, the Minister of Commerce, H.E. Pierre Marie du Mény and the Director General of the Central Bank. The authorities of Haiti confirmed their commitment to the international standards and their determination to ensure a rapid implementation of these standards in their country. The induction programme is designed to help new members of the Global Forum ensure a smooth implementation of the international standards and benefit from exchange of information in their domestic revenue mobilisation efforts. Haiti, which joined the Global Forum in September, 2017, will be reviewed against the standard of exchange of information upon request (EOIR) in 2021. The induction programme will enable Haiti to prepare its EOIR peer review and also take steps towards the implementation of the automatic exchange of information standard. Haiti will also receive assistance to join the Convention on Mutual Administrative Assistance in Tax Matters and to train its auditors in the utilisation of exchange of information during tax audits. During the visit a two-day sensitisation seminar was also held to raise awareness of more than 50 participants from various Government agencies and the private sector on the international standards of transparency and exchange of information for tax purposes and their implications and opportunities for Haiti in the fight against tax evasion.